Record streaks are coming to an end at next week’s US Open, with some big names not appearing. For the first time since 1994, Tiger Woods will miss a US Open. He injured his Achilles tendon and knee during the US Masters and they have not fully healed. On advice from his doctors he has withdrawn from next week’s major championship. “I am extremely disappointed that I won’t be playing in the US Open, but it’s time for me to listen to my doctors and focus on the future,” Woods said. This is the third major championship Woods has withdrawn from since 2008. 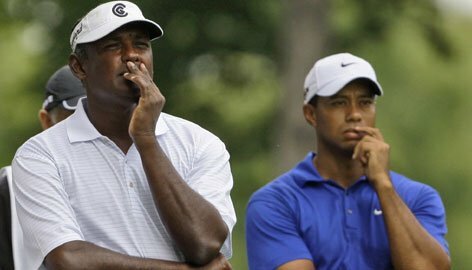 Vijay Singh also looks set to miss the US Open, bringing an end to his streak of 67 consecutive appearances at majors. He didn’t bother to turn up for US Open qualifying on Monday. In fact, he didn’t even bother to tell anyone he wasn’t turning up. He can still make the field by finishing in the top two spots this week at the St.Jude Classic. Mike Weir will also miss the US Open. His streak of 47 consecutive majors is the second longest behind Singh but he failed to earn a spot at Monday’s US Open qualifying tournament.